This article is an expansion/modification of an email I wrote to a friend, in response to a request for a critique on a still life (a fruit arrangement not included here). I later added these W.I.P pics of a small pastel, which I've used for the demo. The pics help illustrate the ideas contained in the article. I hope its of some use to whomever is reading this post, even though at times it may read as being addressed to a particular person. how to interpret and then make different mixes of colors. 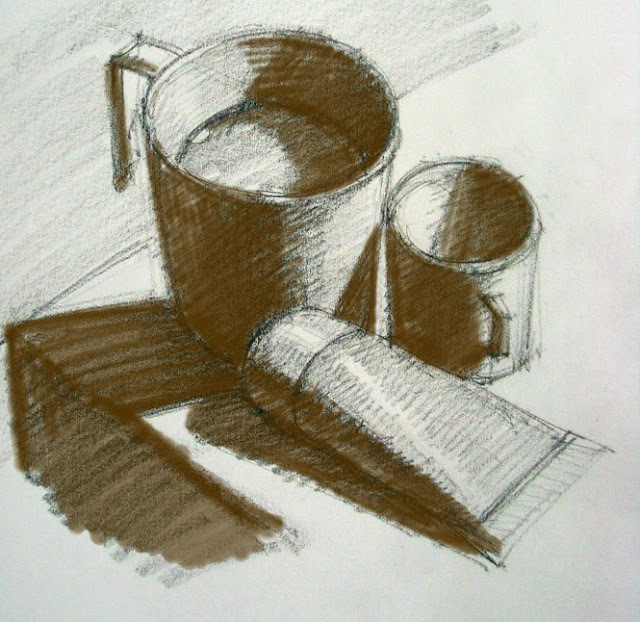 All these are tremendously important in improving our ability to look, which is the primary skill one needs to develop in order to improve drawing, painting, coloring and value skills - all of which undoubtedly affect the quality of our regular work (be it 'abstract' or 'realistic'). 1) Simple light arrangement - You've chosen a rather complex, multi-directional lighting for this (I can see at least two shadows on the ground). Its best to have just one shadow casting light, angling in from top-right or top-left, slightly to the front (daylight from a single window will do, if not use a common light bulb - not the diffuse tube light!). A white or very pale colored wall on the side opposite to the light source, or a white sheet /curtain strategically hung, will reflect a soft glow on the shadow side of your target object(s), thus bringing out the darker shadow zones between the direct light and the reflected glow. This will enhance the sense of dimension even more. A common incandescent light bulb, which is a 'point source' like direct sunlight, will cast sharp shadows of an object on its neighbor(s). At the same time, the shape of that neighboring object will also affect the shape of the cast shadow itself. Imagine/compare the shadow of a post on the flat ground, with that on a corrugated surface. In the first instance the shadow will be straight, while it'll be wavy in the latter. Noting this phenomenon will further co-relate one object in the present still-life assemblage to another, and also to the ground on which it is placed. Obviously the ground will also receive a cast shadow, and if its covered in a piece of cloth that has folds/ripples in it, those will also affect the shape of the shadow. N.B. We may later on (while painting) note the color of the shadow - its usually a darker version of the local color of the object, on which it has formed. However, if there is a softer, secondary light filling the shadows (e.g. the light from the blue sky on a sunny day, when the sun is the primary light), the shadows will be bluish. This is especially seen on a white/pale object, which by itself minimally affects the color of the secondary illumination (think of the shadow side of a snowman under that blue sky). Here the sun can't illuminate places where shadows are formed, while the diffuse sky light, coming from all around, tints those shadows with blue. Bottom line - have a simple still-life arrangement, with one point-source light, angling down slightly from the front. Plus a pale reflecting surface on the opposite side. 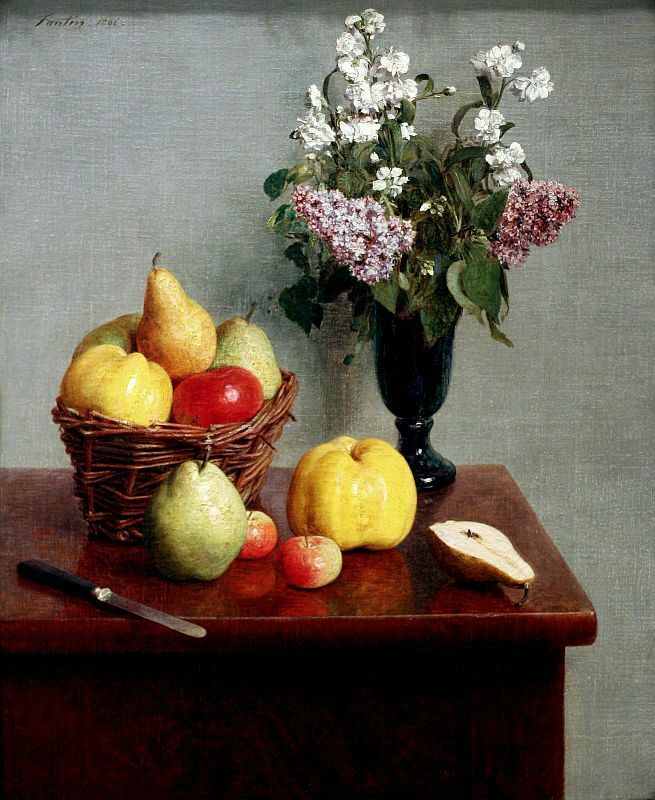 Have a look at this still life by J B Chardin (click to enlarge and study closely if you want to)... see how well integrated each object is to one another with those reflections, counter-reflections and shadows! Notice where the light is coming from, and the direction in which it's casting shadows. There are also shadows on the objects themselves (lets call these body shadows), apart from the cast ones. Indicate lightly, say with a pencil, the areas which are in shadow and which are in light. Some areas will have a diffuse transition zone between lit and un-lit areas, depending on the shape of the object (diffuse for round/cylindrical objects, sharp for boxes, which have corners). Indicate accordingly with hatching marks. Remember, this is only a kind of training, helping you to look for areas of different illumination in the scene. So don't go overboard with your hatching, unless you're doing a finished pencil drawing. Also, disregard all reflected illumination at this point, even if you can see those. 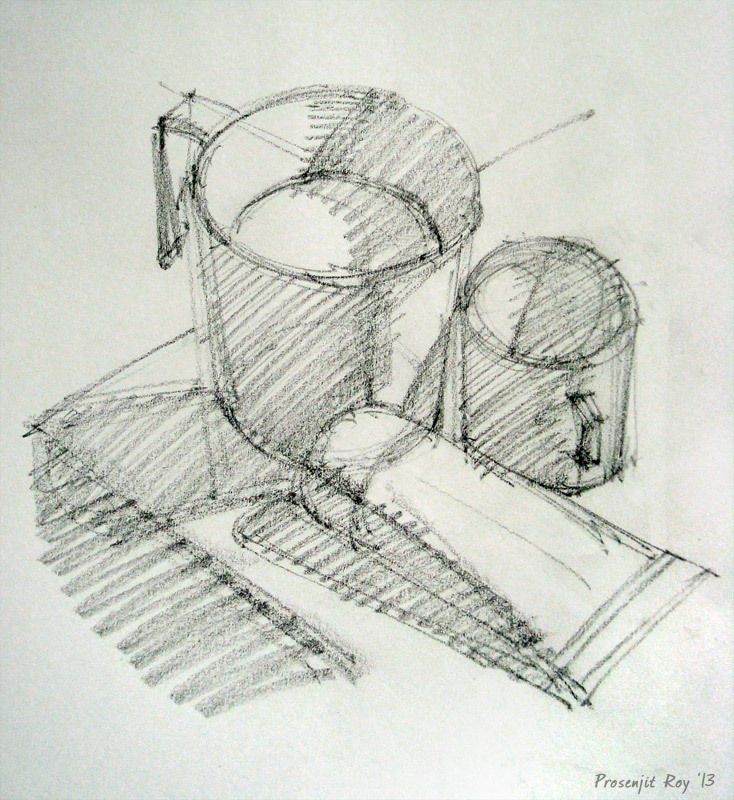 This is a small sketch, approx 6" x 6", of a simple still life arrangement. At this stage, I've indicated the basic shapes, and how these are overlapping each other. Here I've separated lit from unlit zones, and filled up or 'blocked' those shadow areas. Notice the shadow of the cup, cast on the lower corner of the mug. So, once you've separated the shadows from the light, fill up those shadow areas with a homogenous, middle-gray (use plain, diagonal hatching marks to do this quickly, kind of like what I've done, if you ultimately intend to 'paint', rather than 'draw' this scene). Since I had also intended to do a little drawing demo, I went ahead and did a rough finish as you can see. Normally, I wouldn't have bothered to do all that shading, and directly gone on to the painting stage. Red arrows - reflected illumination or 'glow'; This is within the blocked-in shadow zone, being softly lit by light reflected from surrounding areas e.g. a nearby wall, curtain, floor. This area must never be brighter than the directly lit areas. Yellow arrows point to the darker shadow zone between the lit and the reflected glow areas. 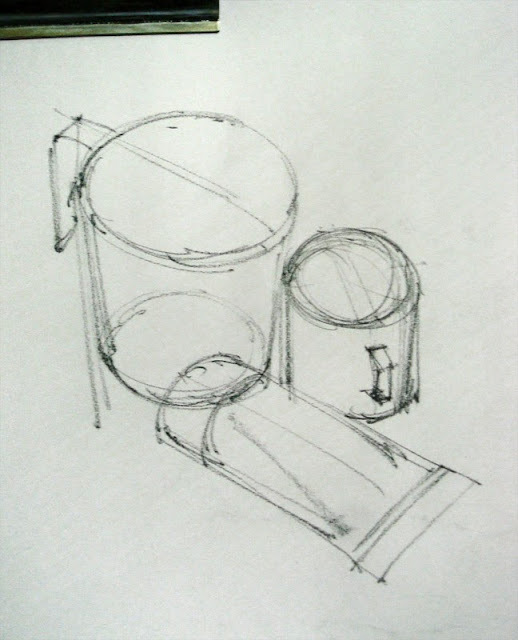 This is also known as the Core Shadow area and are very important in giving that 'sense of turn' to the object. Beyond the core shadow area, the object gradually emerges into the lit zone, revealing its true local color. Blue arrows - cast shadow areas. Note that this is darkest closest to the object (e.g. the rim of the mug near the table-top, or immediately under the paint tube). Cast shadow areas are often lit up in the color of the secondary light, as explained in sections above. When using a single point-source light, cast shadows have sharp edges. Green arrow - indicates the highlight zone, which has the maximum concentration of light rays directly reaching the viewer's eyes (hence often appears burnt out, or 'white'). Depending on the shape of the object, the shape of the highlight may change (e.g. its linear on the side of a cylindrical/conical object, round on a spherical one). It will also vary according to the texture of the object's surface. Shiny objects will have small, bright highlights. Rough objects will have dimmer, wider highlights. The middle tone - This is the lit area between the high light area, and the core shadow area (i.e., area between maximum light and maximum dark on the object concerned). 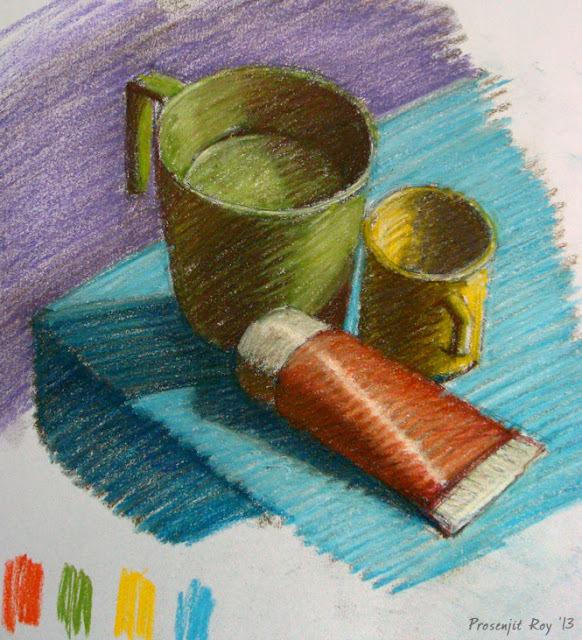 It is to be painted with the actual color of the object. After this, extend that burnt umber tone (previously painted in the shadow zone) towards the lit area, progressively lightening it with water (or white paint, whatever is convenient), from the shadow zone upto the highlight zone. As mentioned previously, this is the middle tone of your picture - these areas are not in shadow, but between the high light and the shadow areas, and they are most representative of the object's colors. After you've painted the middle tones, and thereby established the highlights as well, stand back, and look - ascertain which areas need the darkest darks (i.e., those areas where no light is reaching, e.g. near the rim of the mug close to the table-top). Without diluting your umber, paint those areas directly. You may add a little prussian blue to the mix to darken further. Now you have a complete value study of your scene. 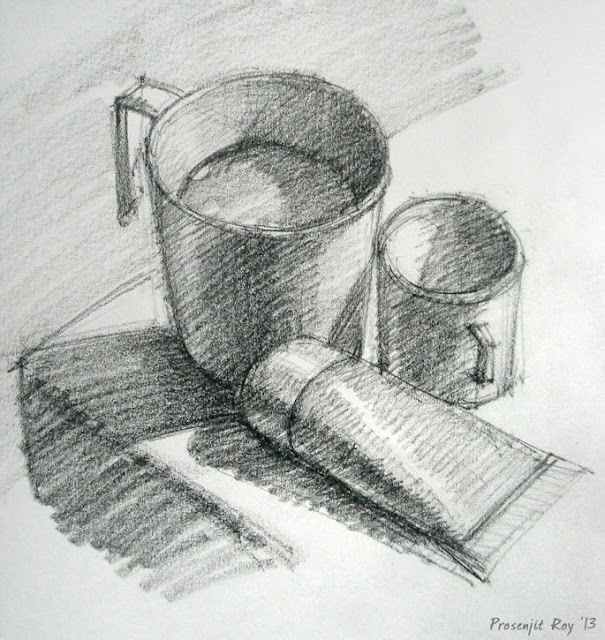 I'd suggest, paint a few of these value studies using simple still life objects - say a cup on a saucer, placed on a white cloth. The value study may also serve as an Underpainting, over which you may continue to add progressively opaque layers of color, with the underpainting guiding you on the local value. I've used a burnt umber shade to do the initial block-in. Then I've painted the middle tone areas with a few broad strokes, just to indicate to myself the actual color of the objects. 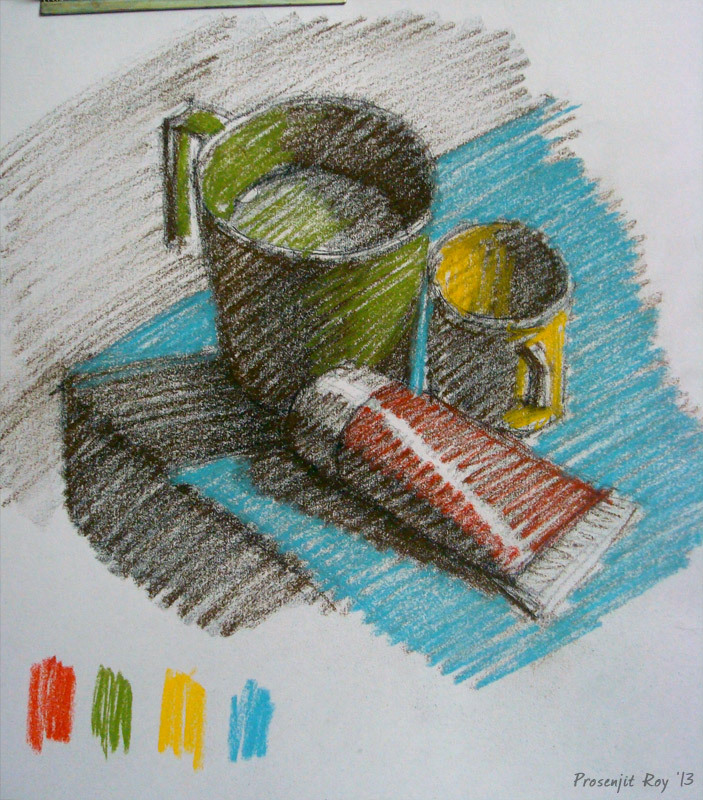 Note the sample color patches at the bottom left, representing the colors of the mug, cup, tube and table-top. I'll later choose some other color for the background. This whole thing served as my pastel underpainting. I continued to add color on top of this 'underpainting' - remember, a color in shadow is not black, its just a darker version of that same color. The opposite is true for that color in the highlight zone, i.e. it is a lighter version of that same color. If you're painting objects with surface patterns, textures etc, (e.g. apples, which has linear streaks)... paint the dominant color first. Say, a shade of red. Paint it out entirely in that color, modifying its values according to the shadow scheme. You may paint the texture streaks later on, while finishing up. 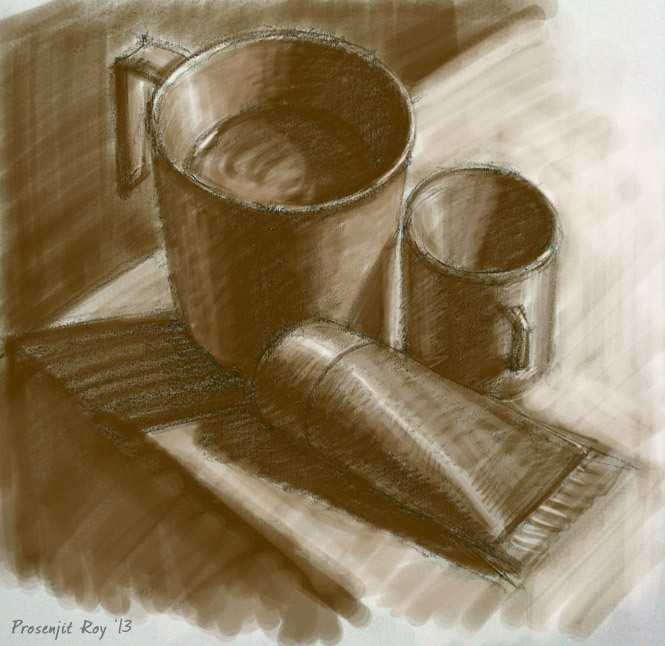 Here I'll repeat what I've already said during the value study (digital) demo - After you've painted the middle tones, and thereby established the highlights as well, stand back, and look - ascertain which areas need the darkest darks (i.e., those areas where very little light is reaching, e.g. near the bottom of the paint tube). Without diluting your umber, paint those areas directly. You may add a little prussian blue to the mix to darken further. Now is the time to paint reflected glows on the shadow side. Always remember - these indirectly lit areas MUST NEVER be brighter than areas which are directly lit. Most often, they take on the color of the neighboring object light is being reflected from - so, if there's a green fruit near a red apple, the reflected glow will have a green tinge on that apple's shadow area. Also, a matt surface will reflect less light (and thereby color) than a shiny surface, so all objects may not be similarly lit/colored by reflected glow. The finished study, 6" x 6", pastel on paper. Took me about 1-1.15 hrs (excluding the digitals, of course). Arrows pointing to reflected light/color on objects on their shadow side. 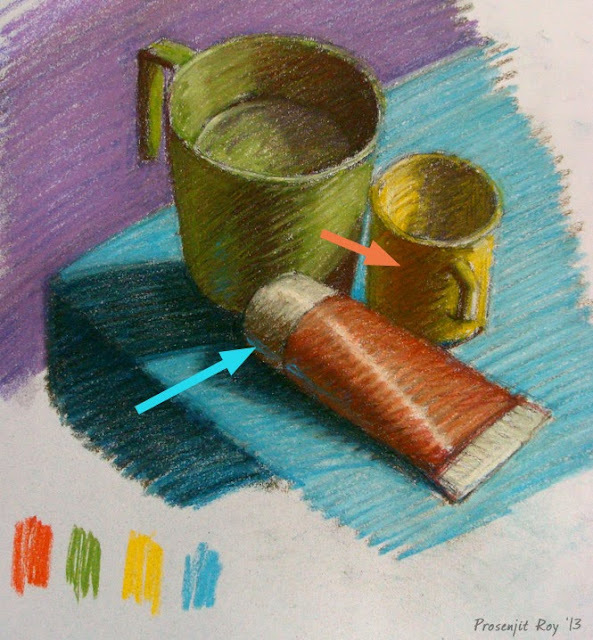 The paint tube is reflecting color from the blue table-top, the yellow cup is reflecting color from the reddish tube itself. What a great post, thank you--this one is a "keeper." And something to share with other artist friends....I do thank you! Thanks for sharing Meredith. I'll be digesting all that's here for a while. I can always count on you to find the most interesting and informative posts. excellent information Prosenjit! 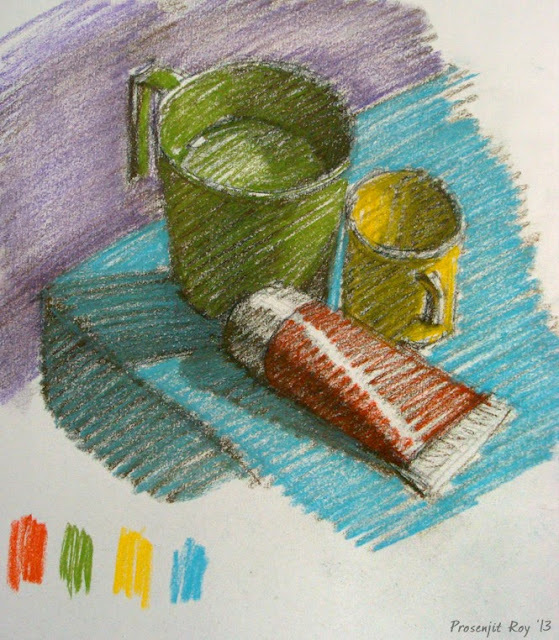 The yellow and green cups touch - which creates a tangent - and if possible, we want to avoid those as they can flatten space.. At least we teach that when we roll out composition here to drawing students! - cheers and hope you are thriving!